← Bougainville News : Download report and watch video @Jubilee_AU Long Han Blong Yumi (It’s in our hands) and report, Growing #Bougainville’s Future. (iv) strengthening the ABG’s understanding and commitment to women’s empowerment and addressing some of the major issues faced by women in Bougainville communities, especially gender-based violence. From 26 to 31 August, a mission of the partners of the UN Secretary-General’s Peacebuilding Fund (PBF) including Australia, Belgium, Germany, Japan, New Zealand and Norway visited Papua New Guinea (PNG). The mission allowed partners to engage with the Government, civil society organizations, beneficiaries and the UN System and appreciate the impact of the PBF’s support. Participants discussed the PBF engagement approach, project results and also challenges and remaining needs in peace consolidation. The mission included visits to Port Moresby, the capital of PNG, and to Buka, the capital of the Autonomous Region of Bougainville, which has been the focus for the PBF’s support. Bougainville is an autonomous region within PNG. After nearly a decade of a bloody conflict between 1989 and 1997 resulting in about 20,000 casualties, the PNG Government and representatives of Bougainville actors involved in the conflict signed the Bougainville Peace Agreement (BPA) in 2001. This agreement provided the legal basis for the establishment of the Autonomous Bougainville Government (ABG) in 2005 and a gradual transfer of powers from the national Government. It also included provisions for weapons disposal, governance arrangements, and a referendum on the political status of Bougainville, the outcome of which is subject to the ratification of the PNG National Parliament. Since 2001, the Agreement has enabled political dialogue between the PNG Government and the ABG and paved the way for the referendum planned for June 2019. In this period, Bougainville has remained largely peaceful thanks to ongoing peacebuilding efforts. That said, many challenges remain, including key joint decisions yet to be made, additional progress with weapons disposal, reconciliation, integration of ex-combatants and outliers to the peace process, community confidence in the process and social cohesion. The planned referendum will be a critical milestone in this process. To strengthen the implementation of the BPA and assist the two Governments in making the necessary joint decisions, the PBF support to PNG commenced in 2015 following the declaration of PNG’s eligibility for the Fund by the UN Secretary-General in view of the approaching referendum. PBF support has included two phases totaling $15 million in allocations. The first phase of $9 million was implemented between mid 2015 to early 2018, while the second totaling $6 million commenced in 2018. Priorities for PBF support have been : (i) strengthening the relationship and trust between the PNG Government and ABG towards effective implementation of the BPA; (ii) empowering the people of Bougainville to make informed choices in the referendum and increased confidence in the BPA process through access to objective information and fora for dialogue; (iii) strengthening community social cohesion and security in Bougainville through opportunities to deal with conflict-related trauma and resolution of local disputes; and (iv) strengthening the ABG’s understanding and commitment to women’s empowerment and addressing some of the major issues faced by women in Bougainville communities, especially gender-based violence. In addition to continuing with the first two priority areas, the new PBF phase of support includes (v) a joint and community focused process for weapons disposal and factional unification in Bougainville, accompanied by support for targeted community interventions on security and social cohesion in zones of political factions which had not signed up to the Peace Agreement, and (vi) stronger involvement of women and youth in the Peace Agreement and referendum processes. Projects are implemented by UNDP, UN Women, UNFPA, UNICEFand OHCHR together with partners. The Mission started with a meeting with the UN Resident Coordinator (RC), Gianluca Rampolla. He highlighted some of the important steps taken recently on the path towards the referendum, including agreements on the Bougainville Referendum Commission, but raised concerns on the short remaining timeline and the ambitious steps still pending, including the voter roll and the precise formulation of the question on the ballot. An economic downturn made it more difficult for the national Government to allocate funds for various aspects relating to the peace agreement and the referendum, including the Bougainville Referendum Commission, the weapons disposal and the restoration and development grant. But two sides have a common interest in making progress and maintaining the process’ integrity, not least because Bougainville’s political status will not be determined by the referendum alone. Rather, the referendum will lead to consultations between the two Governments on the next steps, including the national Parliament’s role in considering the referendum outcome. Any transition will take time and may require the amendment of the PNG Constitution. The RC highlighted that PBF support in 2015 had come at a crucial moment when the two Governments’ relationship was under some strain. “The Government has increasingly requested the UN to be part of a very sensitive political space in the lead up to the referendum in Bougainville and none of this would have been possible without the PBF.” The PBF enabled the UN to work better together and sharpened the preventive focus of the UN Country Team, providing a common platform. The Mission team also listened to a briefing by the Autonomy Review experts, who were in country to conduct a fact-finding mission. This is the second such review since the ABG was formed in 2005. It is mandated by the BPA and its objective is to provide a neutral assessment of the state of progress of autonomy arrangements by the ABG and the national Government. The current review is funded by the PBF. The Mission participants then continued on to Buka (Bougainville) where they met with key ABG leaders and officials over two days, including the Vice President, the Deputy Chief Secretary, the Minister and the Secretary for Peace Agreement Implementation, the Speaker and Deputy Speaker of the House of Representatives, the Minister for Community Development, women Parliamentarians, Bougainville Women’s Federation, members of the Community Government, human rights defenders, and a selection of ex-combatants, including an ex-combatant Parliamentarian. PBF is also seen to be helping the ABG and the political factions to negotiate amongst themselves and come to common positions. Moreover, PBF support has enabled creative positive connections between PNG and ABG, including through a recent helpful visit by the leadership of the PNG Council of Churches. Hon. Marcelline Kokiai also stated: “Through supporting the Referendum Ready process, the PBF has made souls meet. People who had not spoken to each other since the conflict are now coming together.” That said, interlocutors noted the need for additional support for reaching the constituencies, including through the community Government, to ensure that all the 33 constituencies have the support to go through the ABG-designated requirements to be declared as referendum ready and weapons free. PBF support has contributed to some initial exchanges between the two Parliaments including the support to visits of the National Parliament bi-partisan committee on Bougainville Affairs and a draft MOU between the two Parliaments. This was seen as an important step forward, but interlocutors felt that more needed to be done given the level of understanding for and commitments to the BPA were still rather low. PBF helped increase women’s participation in the political and peacebuilding debate. The female MPs testified how the UN’s accompaniment including training and travel helped reduce marginalization and increase their participation. They were also supported in rolling out three regional women’s unification ceremonies and establishing a parliamentary committee on gender equality and human rights. More needs to be done to address the grievances and demands by the ex-combatants, some of whom continue to be outside the Peace process, and to find ways to involve youth – both of which are included as particular areas of focus in the new PBF projects. Interlocutors in Bougainville emphasized the importance of continued international presence and of UN support for the oversight of the implementation of the Peace Agreement to help ensure continued peace and stability. Some made requests for some kind of a UN or regional security observer mission. ABG expressed hope that the international community could help to ensure implementation of the Peace Agreement. The Mission team was warmly welcomed to a formal ceremony in the Constituency of Hagogohe, one of the two constituencies which had gone through the full Referendum Ready process and declared itself ready. The ceremony included local leaders, women and youth representatives, who celebrated the moment and emphasized the importance of expressing their voice peacefully. The Mission team then attended the opening of one of three youth resource centers funded through the PBF. The center will provide young people with access to vocational training and a space to get information and discuss political, socio-economic and peacebuilding issues. The center is located on land next to the Parliament, which will be helpful in strengthening links between youth and Members of Parliament. Back in Port Moresby, the Mission team met with four Members of the National Parliament representing Bougainville, Secretary of the Department of Foreign Affairs, Deputy Secretary of the Department of Prime Minister and National Executive Council (PMNEC), and Director of National Coordination Office for Bougainville Affairs. The four Members of Parliament stated that they needed additional support for their interactions with the rest of the PNG Parliament and that they hoped to play a greater role in the coordination of funding going to Bougainville. They also emphasized the critical role of the national Parliament’s bi-partisan committee on Bougainville. The Deputy Secretary of the Department of PMNEC explained the variety of issues that PNG was facing and prioritizing, including improving health and education services, empowering local level government, dealing with national disasters etc. 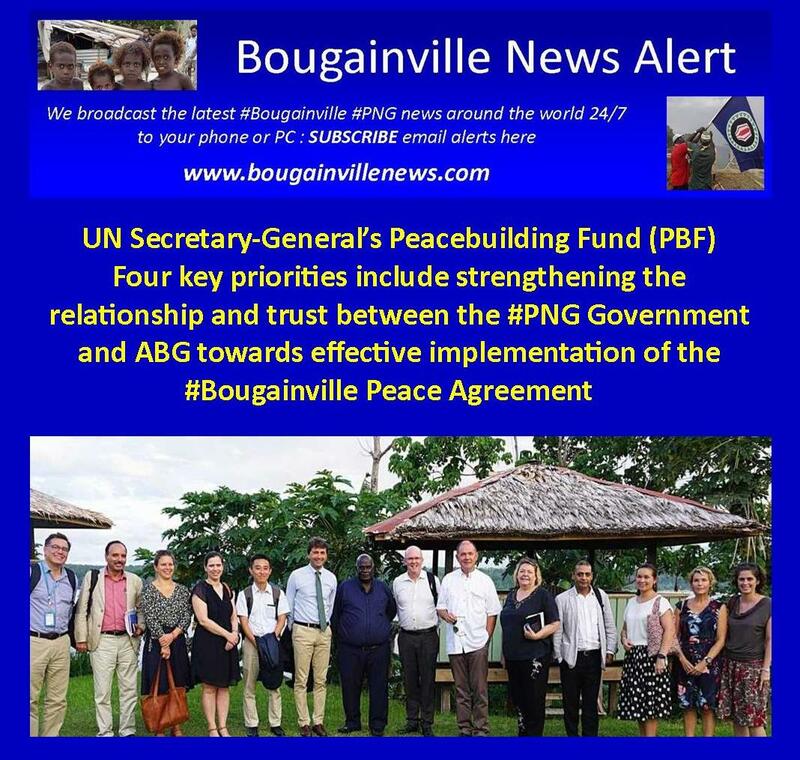 He stated that the UN’s work funded by the PBF was important for the Bougainville peace process and mentioned some of the reasons the PNG funding to Bougainville had been delayed, including problems with ABG acquittals and reports. He also stated that negotiation on the way forward would be key. The Secretary for Foreign Affairs emphasized it was very important for the people of Bougainville to have a chance to express their views and aspirations through the referendum as part of the democratic process. The implementation of the Peace Agreement is also paramount, especially regarding the disposal of weapons. Her Department has been raising awareness of the Peace Agreement and the referendum with the international community. The Secretary confirmed that the UN was considered an objective partner in this process and that the National Government appreciated the UN’s support for the implementation of the Peace Agreement. The Mission team also met with an Australian NGO, Peace and Conflict Studies Institute Australia (PaCSIA), supporting community discussions throughout Bougainville, which is also establishing a partnership with the UN through PBF funding. The dialogues have shown the people in Bougainville have a genuine willingness to discuss the future political status, to understand better the options for Bougainville, and for a closer engagement with their leaders. The UN Senior Electoral Officer presented the Bougainville Referendum Support Project, which still confronts a financing gap of nearly $4 million, following a contribution from New Zealand (other partners have been approached but no further contributions have materialized so far). He emphasized the country was 18 months behind the original notional calendar of preparations for the referendum proposed by the UN. Too much focus had been placed on the target date, and not enough on the process to get there, especially the voter roll which presents an important challenge. The funding from the PNG Government had not yet reached the Bougainville Referendum Commission. The question(s) have still not been formulated. It was still possible to catch up but with considerable challenges. The UN Country Team made a presentation on the work in the Highlands region, following the recent earthquakes and humanitarian crises, which required UN assistance to a region that had been largely inaccessible. The UN has conducted a conflict analysis, which shows deep and complex conflict causes and factors in a region fraught by tribal tensions, disagreements over mining and land, high levels of inter-personal violence, increased access to guns, and little presence of and trust in the state. The UN team emphasized the importance of not leaving the Highlands behind but finding innovative ways of supporting local peace champions and local means of conflict prevention and resolution while increasing state presence. The UN is currently applying for a PBF grant through the Gender and Youth Promotion Initiative. Importantly, the Secretary for Foreign Affairs similarly emphasized the importance of assisting the Highlands in her meeting with the Mission team. Participants appreciated the clear value-added of the UN’s engagement with PBF’s support in regards to the implementation of the BPA. Participants witnessed the One UN approach in action and the commitment and professionalism of UN staff. Participants noted the broad levels of enthusiasm from the partners they met in Bougainville. The road towards the referendum remains complex, but the UN’s engagement with PBF support was focused on the right issues. One challenge which was raised in the closing session was progress with weapons disposal, which is currently only supported by the UN and needs more commitment from the two Governments and engagement by ex-combatants. Overall, participants concluded to the continued need for PBF support and felt, in the words of Amb. Hanns Schumacher, representative from Germany and member of the Secretary-General’s Advisory Group on the PBF that “the projects in PNG provided a sterling examples of how PBF is working to implement its mandated vision and how relatively minor amounts of money can stabilize a complex situation and make a clear impact”. The UN Secretary-General’s Peacebuilding Fund is the organization’s financial instrument of first resort to sustain peace in countries or situations at risk or affected by violent conflict. The PBF may invest with UN entities, governments, regional organizations, multilateral banks, national multi-donor trust funds or civil society organizations. From 2006 to 2017, the PBF has allocated $772 million to 41 recipient countries. Since inception, 58 member states contributed to the Fund, 33 in the present 2017-2019 Business Plan. The PBF works across pillars and supports integrated UN responses to fill critical gaps; respond quickly and with flexibility to political opportunities; and catalyze processes and resources in a risk-tolerant fashion.